Hollywood’s Gnomon Gallery has announced Territory: a new free exhibition exploring the art of 3D environments, featuring the work of 11 leading illustrators, games and visual effects artists. A diverse mixture of images, ranging from interiors to alien landscapes, the art on show provides a fascinating insight into how artists design natural and fantastical worlds with modern CG software. Artists taking part in the exhibition include V-Ray experts Marek Denko and Toni Bratincevic – the latter familiar to many users as having provided the signature image for V-Ray 3.0 for 3ds Max. 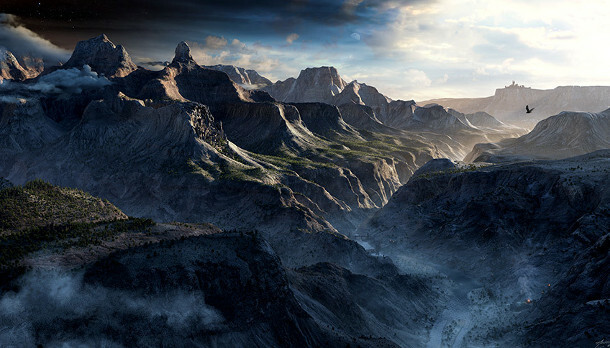 They are joined by Gnomon founder Alex Alvarez, whose own toolset runs from Maya to a range of landscape and vegetation-generation software, and whose image Vista can be seen at the top of the story. Other exhibitors include Infinity Ward senior environment artist Devon Fay and Valve’s David Lesperance. The opening reception for Territory takes place at the Gnomon Gallery in Hollywood from 7-11pm on Saturday 2 April. The event is free to attend, but you’ll need to register online in advance. The exhibition itself is on show from 9am to 6pm Monday to Friday until 11 May 2016, and is also free to attend.